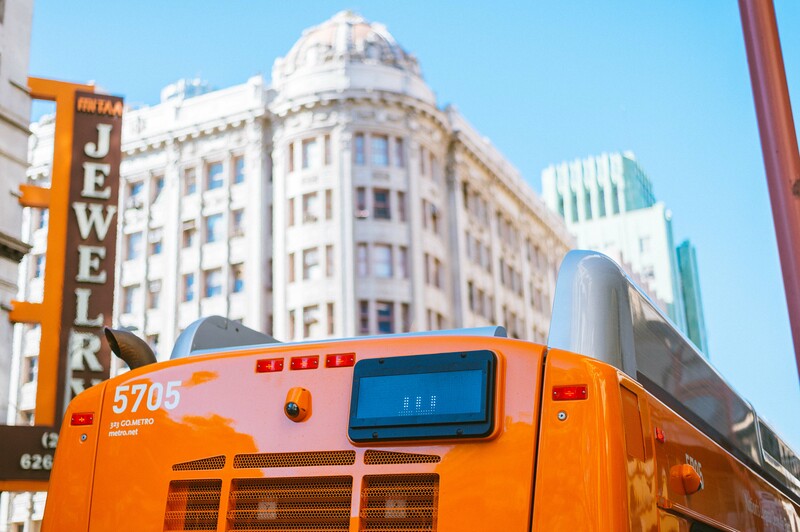 ART OF TRANSIT: A Metro local bus in downtown Los Angeles. Photo by Steve Hymon/Metro. Annie Weinstock and Stephanie Lotshaw argue that there is no need to convert the Orange Line to light rail. A state bill was signed into law earlier this week that rescinded the ban on light rail in the corridor. As we have posted before, converting the Orange Line to light rail is not in Metro’s long-range plans nor has the agency studied the issue. First, simply increasing bus frequency would be an obvious improvement. While there have been concerns that increasing frequency will cause bunching at intersections, this appears to be due to a signal timing issue which favors cross street traffic over public transportation on the Orange Line corridor. Timing traffic signals to favor automobiles shows an outdated mode of thinking. It would take some political will on the part of the city to change the signal timings, but it is a simple solution, far cheaper and faster than upgrading to light railwhich would still be faced with signal timing problems. Then, by raising the boarding platforms at stations to the level of the bus floor, buses could complete the boarding process more quickly, further increasing capacity by allowing more buses to pull into the station more quickly. The system could also phase in more passing lanes at stations, allowing for a quadrupling of capacity and a mix of service types. In addition, changing the intersection regulations, which currently require buses to slow to 10mph from 25, would increase overall speeds along the corridor. The reduction in speeds was initially implemented because of several accidents which occurred at the start of operations in 2005. But most systems experience problems in the early years, particularly where new signals have been introduced. Now, after almost 10 years of BRT operations as well as extensive signage and education done by Metro, these restrictions are obsolete and only make the system less convenient for passengers. This is just an excerpt — please read the entire editorial for discussion of other salient points about bus rapid transit in the U.S. and the Orange Line. As for the issue of signal timing, the traffic lights are controlled by the city of Los Angeles. (UPDATE, JULY 17: Mayor Garcetti told the Metro Board’s Executive Management Committee that the Tribune article was in error and that he did not say which potential alignment he supported at the meeting — and that a tape of the meeting shows that he did not state a preference). At a transportation forum with San Gabriel Valley and San Bernardino County officials, Los Angeles Mayor Eric Garcetti said that he supports the Gold Line being extended to Whittier and that he would like to see it extended to both Whittier and South El Monte if funding can be found to build both. Metro will soon release the draft environmental study for the project; one alternative extends light rail to Whittier, another to South El Monte. Cities along both routes support the project. Important note: an extension of the Eastside Gold Line is a project to be funded by Measure R and under the current schedule would be completed in 2035 unless funds are found to accelerate the project. Garcetti also reiterated that he would like to see the Gold Line Foothill Extension built from Azusa to Montclair (something he said earlier this year) and would like to help find funding for the project whether or not it’s added to Metro’s short-range plan. The Pasadena-to-Azusa segment is under construction (it’s a Measure R-funded project) and scheduled for an early 2016 opening. Funding would need to be found for the Azusa-Montclair segment. The greater context here is that Metro has been discussing a possible sales tax ballot measure in 2016 that could possibly be used to accelerate current projects or fund new ones. The Metro Board of Directors has not made any decision yet whether to take anything to Los Angeles County voters. But the agency is seeking feedback from cities in the county on what type of projects they would like to see funded. If — and it’s still a big ‘if’ –the agency seeks a ballot measure, the big decision to be made is whether the ballot measure would extend the current Measure R sales tax (which expires in mid-2039) or whether it would add an additional half-cent sales tax. The 600-unit residential building with commercial space would occupy the parking lots on the north side of Pershing Square and help densify a section of downtown L.A. that should be dense. The site, of course, sits adjacent to the Metro Red/Purple Line Pershing Square station and is a short train ride or walk to the 7th/Metro Center station that will eventually host trains headed to Long Beach, Santa Monica, Azusa and East Los Angeles. It took Everett Cook 90 minutes to travel the two miles from the Times (at 2nd/Spring) to Dodger Stadium on Thursday thanks to traffic en route. “For what it’s worth, the vast majority of the traffic police and Dodgers employees were as helpful as can be. There might not even be a solution to this — too many cars in too small a stretch will be a problem anywhere,” he writes. As I’ve written many times before, ballpark traffic is the price everyone pays for the decision in the 1950s to build the stadium atop a hill and away from the city grid — and the transit that goes with it. No one wants to move the ballpark into downtown, so it’s likely that traffic will remain an issue. The Dodger Stadium Express provides bus service between Union Station and the stadium is an alternative to driving. It’s free for those holding game tickets. 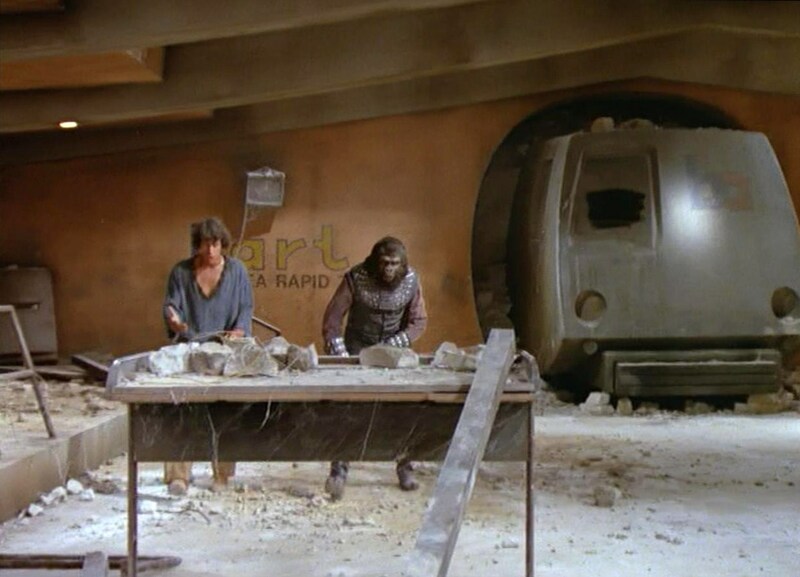 ART OF TRANSIT 2: There are many reasons why a train may go out of service, including the planet being taken over by apes. Credit: 20th Century Fox. Build a trolley to Dodger Stadium. They’re not called the (Trolley) Dodgers for nothin’! Thanks for stating that we should read the editorial on the Orange Line. The editorial is wrong about several things BUT the guest comments are great for the most part and point out the flaws in the reasoning of the editorial. I wish I could add those here but instead a snapshot. Whether you agree or not, I thought it was one of the more thoughtful and thorough articles I’ve seen on the subject. Is there anyway that the Gold Line (or blue line after regional connector is done) could build a spur somewhere between Chinatown Station and the L.A. River that goes under Elysian Park and into Dodger Stadium station? I know it would be costly, but is it feasible? That seems like it would be a good solution to transporting fans to the stadium and it would give people easy access into Elysian Park. It could also be extended west into Echo Park and Silverlake. Not to get too carried away, but it could be an extension of the future West Santa Ana Branch Corridor line. That was a thoughtfully written article about the Orange Line, but I for one am unmoved by it. I say Metro better start preparing to add Orange Line rail conversion to their long-range plans. The pressure is only going to build. Everett Cook will get to Dodgers Stadium faster on a motorcycle. 1. Electric traction is cleaner, greener, quieter, and more comfortable for the passengers than even the most advanced hybrid diesel buses, even if rigged to run on natural gas (or on pure used fry-oil). 2. Steel wheels on steel rails are inherently far more energy efficient than rubber tires on a highway, because of the dramatically lower rolling resistance. It would have been helpful if MTA would have had a station for the Gold Line at or near Dodger Stadium. This would have relieved traffic when there are games. During off baseball season it could have been used as a park and ride station. Having a station in China Town so close to Union Station was ridiculous. You can very easily walk or take a bus between the two areas. Too bad LACMTA didn’t or couldn’t stick to the original plan from the early 1990’s to extend the Redline subway from North Hollywood to Warner Center and have a high capacity mass rapid transit line running where the Orange Line is now, just under the surface. Granted, it would not have been cheap. Subway construction is expensive. but it would have paid off eventually. At grade BRT or or some replacement at grade “Light rail” along the chandler route is a waste of public funds. Why are people thinking the repeal of the ban to build a light rail line in the SFV is specifically for the Orange line? I think the action leads to the building of a light rail from the SFV to West LA. Any conversion of the Orange Line to a light rail should be last on the list of needed lines throughout the greater Los Angeles area. I will campaign and vote against a new tax measure that does not include as it’s number priority a Light rail Line on Santa Monica Bl. running from at least Century City to Silverlake. But why stop there. Extend it southwest and connect it with the EXPO Line so as service goes all the way to the beach. On the east end extend it to Glendale Bl. and First St. and run it thru a re-aligned tunnel to the Subway terminal Building in Downtown L.A. The multi-track station is still there sitting idle for years.